So where does time go? but I can never find the time. Do you ever feel like that? I did manage to make a few fabric Valentines though, that I thoroughly enjoyed. I remember being a kid, and was so excited to fill out all of my Valentine cards to give to my friends at school the next day. Maybe it was that same childhood excitement that filled my heart when I was making these. I think I will still enjoy making hearts even after Valentine's Day. Hearts and birds are some of my favorite things. I also wanted to include this photo of a clay heart I made for a friend a couple of years ago. Thank you for leaving such sweet messages on my last post. It makes me so happy to read each and every one! But I love all your little hearts ~ so cute Becca! these are so lovely! will you give them to friends or sell them? what a lovely idea they are and again I say it every time but you are so talented! my husband doesn't believe in valentine's day so I shall get him a card and hope this year he will change his mind! I love making hearts too. I am crazy for hearts and birds just like you! 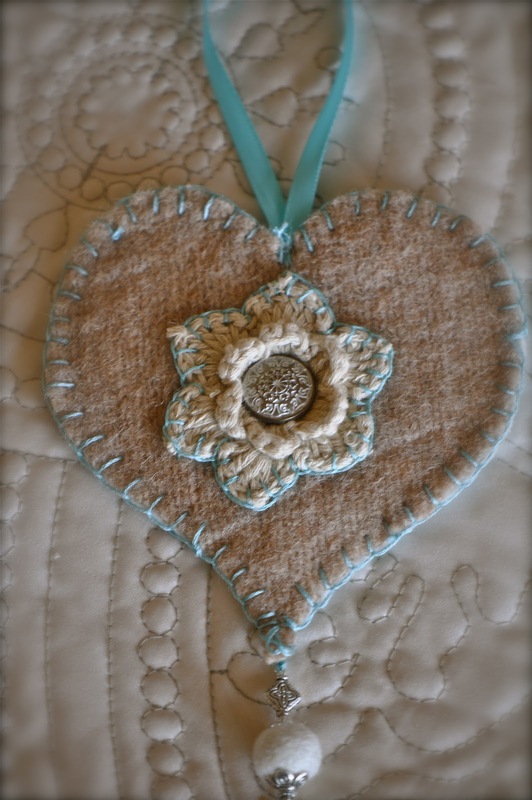 I had made some puffed hearts out of toile material a few years back and have been thinking of making some more for Valentines Day! You do pottery too? I love pottery the island here is full of potters! Beautiful photos and the hearts are so cute. Someone will be very pleased with them. How extremely cute! I love anything pertaining to crazy quilting. Great idea! Love 3 of them!! I love hearts! They are the ultimate symbol for everything good! 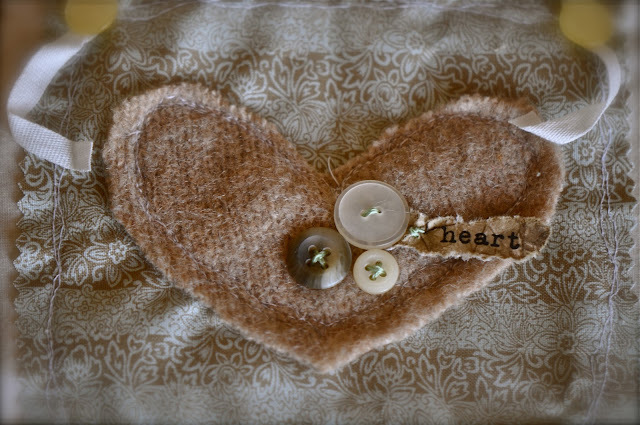 Love your hearts, especially the little wool ones. I love hearts and birds also. The two go together so well. Glad you are staying busy. Becca - These are amazing! Each is truly a work of art, and the amount of love that went into making them is so obvious! Beautifully done. All your hearts look so pretty.. They do look like you had alot of fun stitching on them.. I hope you had a nice weekend!! You are a quick study! Your CQ hearts are great! I love hearts, too. BEAUTIFUL, Becca! I can't even choose a favorite! Oh wow! I love them all...simply creative! I agree ... I make hearts all the time!! Oh your hearts are so sweet! What a great idea and all those different styles - what fun you must have had dreaming them all up. I always liked Valentine's Day as a child and stil do - it's nice to show you care. I bet you smile the entire time you're making hearts :-) That beige & blue is so dear... a necklace? a keepsake? an embellishment for (insert wonderful ideas here)? Your hearts are gorgeous Becca. I made some and was so proud of them, but they are plain and simple ones; nothing like yours. There really isn't enough time in a day is there? Love your hearts, thanks for sharing.